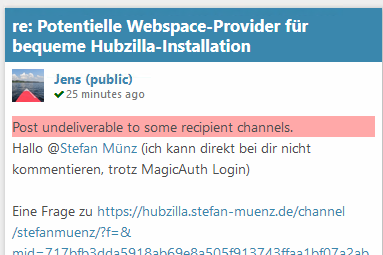 Post undeliverable to some recipient channels. I see undeliverable message on my posts. What could be the reason for this? After the Hubzilla 8.1 update I am not able to see the Dispora posts from my connection too. Dispora protocol is enabled. did you look in the apps page? diaspora is found in the "available apps"
Thanks for your help. But why are apps and addons have different pages now? As you have probably already noticed, there were some dramatic changes to the settings and app infrastructure in the 3.7 development cycle. We left behind the central settings page a.k.a Settings > Additional Features in favor of per app settings pages. Basically every app with settings has an easy accessible (cog icon next to the app name in the panel) settings page. Feature settings for the post editor are accessible via the cog icon in the editor. Feature settings for post/comment interactions (star posts, community tagging, emoji reactions, dislike button) are accessible via the item dropdown menu (bottom right) of each post/comment > Conversation Tools. Some features have been transformed into stand-alone apps. Privacy Groups, Wiki, Notes come to my mind. There are many others though. If you had one of the transformed features enabled, you will now need to install its app equivalent. E.G. you will need to install the Privacy Groups App to be able to manage your privacy groups. Some addons have already been ported to the new app infrastructure (all the federation protocols, n_s_f_w, startpage, etc). The remaining will be ported in the next release cycle. Basically here applies the same as explained above for the core apps. If you had an addon enabled in the addon settings, you will need to install its equivalent app (diaspora app, n_s_f_w app, etc). If you had features/addons enabled that have been "appified" you will need to install the equivalent apps for the channel. Most of what were called, "Features," were just apps/addons that had been integrated into the core. This caused confusion. The decision was made to move to a consistent user experience. Whether it's a "feature" or an "addon" - doesn't really matter from an end-user perspective. If it's something that users can turn on/off or in some way be configured - the UI is now consistent (or will be). There aren't 2 different places to look for stuff any more, and now hub members don't have to keep track of the difference between "Features" and "Addons". Which is just as well, because they shouldn't have to care that there's a difference. It was just the change that confused me. But it looks better now.